Explore, Learn, Have Fun! 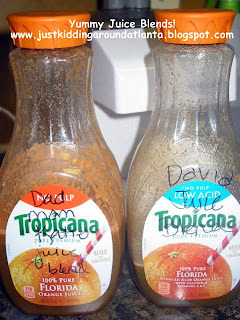 : We're going to start a Juice Fast!! Last week, I was walking on the treadmill, and I asked David to find something for me to watch on the Wii (Netflix). (I am way too tech-challenged to use the Wii remote, my kiddos have to help mom out!) Under new releases, he found a documentary called "Fat, Sick and Nearly Dead" that sounded interesting. WOW. is all I can say. It is a must see if you struggle with your weight, or have health problems. Basically it's about an Australian man named Joe Cross who is overweight, on lots of medication, and ready to tackle his demons. He comes to America, and travels while he fasts on fruit & veggie juices for 60 days. He loses a massive amount of weight, and inspires others along the way. Particularly, a truck driver who suffers from the same health issues, but weighs about 100 more. He also does a 60 day juice fast and is able to drop a HUGE amount of weight, and also improves his health tremendously. Check out the trailer here! Well, that inspired me. I just wrote about how my kids don't eat much fresh fruit or veggies. Kind of ironic. Luckily, they are on board with this juice fast idea! We have a crappy juicer, but it works. 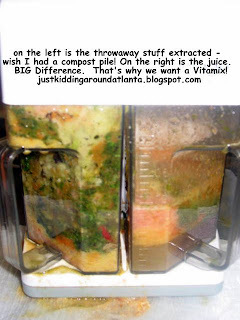 (It just extracts the juice only - there is SO much wasted fruit/veggie peel/pulp!) 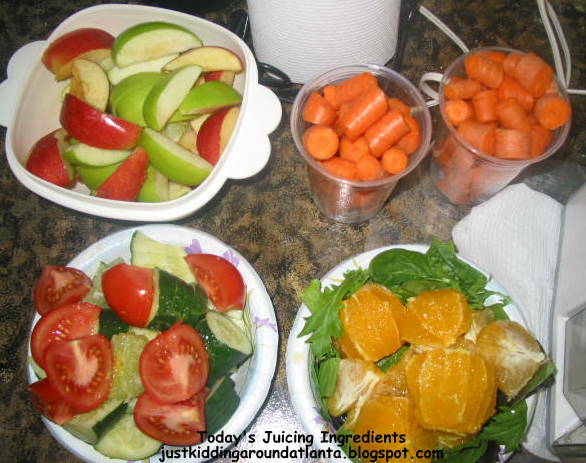 Starting Sunday 3/18, Randy & I will be drinking 3 "meals" a day of fresh juice. Katie will be drinking 2 meals a day, and David will just supplement his breakfast with a glass of fresh fruit/veggie juice. As far as weight loss, I need to lose at least 60 lbs, probably more like 80 to be where I want. Wonder how far I can get in 60 days? Once I get to my goal weight, I'll be juicing for breakfast forever - I actually am surprised at how much I'm enjoying the juice! I'll also plan to do a 10 day juice fast every 3 months or so. SO excited/motivated/inspired!! Katie wants to lose some weight before graduation, as do I - I'd like to be comfortable in front of the camera for once in her graduation pictures!! But mostly, I want energy. I'm exhausted all the time lately. I'm unhappy with how I look, and I don't eat much in the way of fruits or veggies. I want to feel like I did 10 years ago! So - We 've all started drinking one glass of juice a day in preparation - I hear drinking 2 or 3 glasses a day can shock your system (ie - potty all day - yikes!) if you aren't ready, lol! Hopefully easing into this lifestyle change will be good. 1 or 2 limes & lemons, a couple handfuls of spinach (or kale), 2 apples, 2 oranges, 1 or 2 tomatoes, 1 carrot (don't tell him a carrot is in there!) a couple cups of watermelon, a handful of red grapes, about 1/4 of a pineapple, and a little fresh ginger. 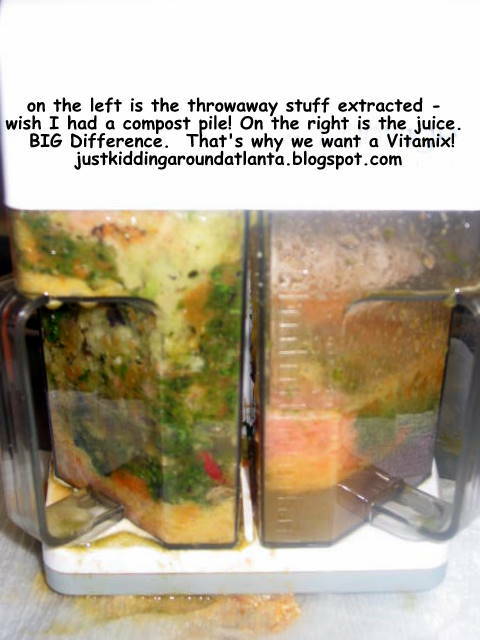 I'm juicing at night then storing it in the fridge for up to 2 days. (I've read that you can store it safely up to 72 hours, but I don't know for sure - that seems like a long time. 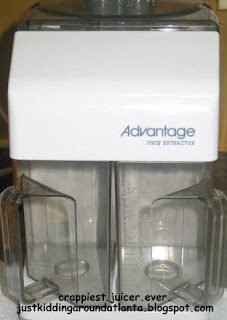 I also just read that glass is best for storing juice, and that you want very little air in the container - oops!! I will have to get some mason jars to store it in. I'm also adding a healthy amount of lemon & lime juice to each batch - the citric acid helps preserve it too) I will post once a week and keep y'all updated on our progress, how we're feeling, etc! Hope you'll follow along here, and please feel free to leave your questions or comments! Also, follow me on Pinterest (button at top right of blog) I've got a juice fast board with recipes and ideas I've found!